Hockey and real estate are passions for Calgary realtor Ken Eddy. 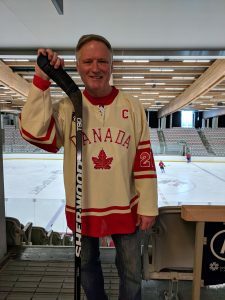 Eddy, who has been with RE/MAX Real Estate (Central) for almost 30 years, has written two books about the industry and each year he organizes two hockey events that bring together other realtors in pursuit of Canada’s national past-time. 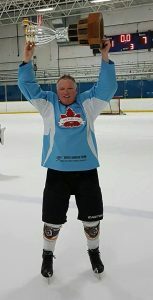 Eddy is the driving force behind the annual RE/MAX hockey tournament (Macklem Cup) where agents across the country – and a few other folks like friends, mortgage brokers and avid hockey players – join in to network and raise some money for the Children’s Miracle Network. And he also organizes a group of hockey players (Team RE/MAX) to play against other countries in overseas trips each year that take place in the fall. It will be in October this year. “I’ve played hockey since I was five years old,” says Eddy, who grew up in Sault Ste. Marie, Ontario. You could say hockey is in his blood. The Macklem Cup began about 24 years ago when someone from Edmonton asked Eddy if he could bring a hockey team up to Edmonton to play in a tournament with a bunch of realtors. There were four or five teams in that initial tournament from Edmonton, Calgary, Winnipeg and Saskatoon. It evolved into a tournament where all the players now fly into the host city – Calgary this year just recently – and everyone is drafted onto equal teams. “The vast majority of players are RE/MAX agents and the synergy you get is great,” says Eddy. The most recent tournament had 56 players and four teams. The games were played at Winsport and players came from Chicago, the Yukon, Regina, Saskatoon, Edmonton – 40 of the 56 were with RE/MAX. Eddy says that each year between $2,000 and $4,000 is raised for the Children’s Miracle Network. The hockey tournament has evolved to the point where it’s going to be right after the Super Bowl each year with next year’s location in Edmonton. Eddy had always wanted to go to Europe to play hockey. So back in 2000 he gathered a bunch of friends and went over to the Czech Republic. Since then a group of hockey-playing friends have gone on 12 different tours and have played in 18 different countries from Europe to Russia to Japan – playing local teams. “It’s just a blast. I can’t tell you how much fun we’ve had,” says Eddy, adding that two-thirds to three-quarters of the people on those trips are RE/MAX agents from Western Canada and the balance are friends of his. This fall the group will be playing in Romania, Bulgaria and Serbia. When he’s not pursuing his passion on the ice, Eddy is busy writing books about real estate. His first book was called Secrets of Success: 10 Reasons Why 10% of Realtors Control 90% of the Business and the second book was called Snakes and Ladders: A Realtor’s Journey to Success. “The third one I’ve been working on for a couple of years. It’s called The Interview with a Realtor,” says Eddy. Oh and if hockey and writing books wasn’t enough, Eddy, of course, spend time selling real estate in Calgary.